There has been strong interest in the composition and it will go on a separate live tour later in the year. 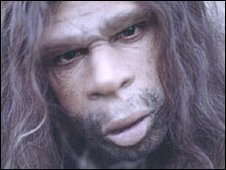 Neanderthal man existed side by side with early homo sapiens before becoming extinct some 30,000 years ago. Despite having a reputation for lacking intelligence, recent research suggests the neanderthals were a lot more resourceful and innovative than was first thought. Thorne said: "Given that Neanderthal's man brain was about the same size as ours, and much of our brain is given over to language, then you can assume they probably had language too. "Every culture has language and music, so we can probably assume that they had some kind of music too." His 75-minute composition was commissioned by National Museum Wales to provide a musical illustration for the palaeolithic section of its exhibition Origins of Early Wales. 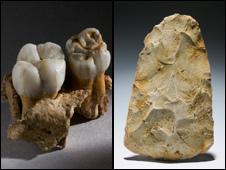 The exhibition includes artefacts like a Neanderthal hand axe and teeth found at Pontnewydd in Denbighshire and, as part of his research, Cardiff-based Mr Thorne visited the cave where they were found. 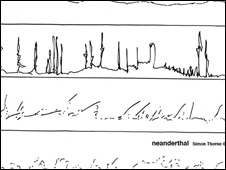 He said he was the first to admit that knowing exactly what Neanderthal music would have sounded like is impossible. "It's a ridiculous notion to suggest we could ever know the precise role that music played in the lives of the Neanderthals, but imagining it has been a fascinating experience." The composer has also researched the era extensively and been inspired by two books - Prof Steven Mithen's The Singing Neanderthals and David Lewis Williams's The Mind in the Cave. Prof Mithen will be at the museum launch and, in conversation with Mr Thorne, will talk about the role music may have played in the lives of the Neanderthals. The Reading University academic, whose research centres on the evolution of human language and musical ability, said Thorne's work was "a fantastic go at evoking the sense of prehistory of our human ancestry". He added: "He is trying to create the whole sense of being there at that time." As well as the music, a specially commissioned film will help transport those present into a neanderthal cave. It will go on tour, complete with four singers, stone instruments and a video project to Harlech, Cardigan, Milford Haven and Swansea at the end of March, and already Mr Thorne has had "great interest" in his experiment from the British Museum. He said the project had given him an insight into our own communication. "We as human beings are instinctively creative," he said. "We can't not be - we have to invent things and who's to say Neanderthal man did not invent the beginnings of music?" "We use language for words, to communicate. But how do we learn language? If you look at babies and the noise they make, they learn to make singing noises before they learn to speak."